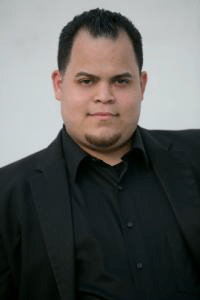 Tenor Edgar Miguel Abréu debuts at Florida Grand Opera this season. Previously, he has appeared as the tenor soloist in performances of Handel’s Messiah at both FIU and Florida Atlantic University, as Don Ottavio in Mozart’s Don Giovanni with Florida Atlantic University, and as Lippo Fiorentino in Weill’s Street Scene with FIU Opera Theater, where he also recently sang the role of Le Roi Ouf Premier in Emmanuel Chabrier’s L’étoile. Edgar also serves as music director and pianist at Our Lady Queen of Heaven Catholic Church in North Lauderdale, FL, and as director of the Teaching Outstanding Performers camp at Florida Atlantic University. He earned his Master of Music Degree in Vocal Performance from Florida International University and his bachelor’s degree from Florida Atlantic University. This season at FGO, Edgar will perform the roles of Ambrogio in Rossini’s The Barber of Seville and Flavio in Bellini’s Norma, and will study-cover the roles of Pollione in Norma and Walter in Weinberg’s The Passenger.